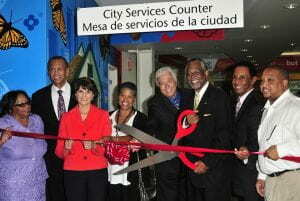 Led by Los Angeles Councilman Curren Price Jr., more than 100 small business owners gathered at the District 9’s field office for the ribbon cutting of the new CD-9 Business Center. Located on the corner of Central and 43rd Street in the historic jazz corridor, the center aims to expand the district’s business enterprise through a network of service providers referred to as Distinguished Partners, including USC. The university’s Civic Engagement office will provide resources through the USC Family of Businesses, which oversees such programs as Bridges to Businesses, a procurement-assistance program, and the USC Popular Community Bank Small Business Leadership Forum. USC Family of Businesses and CD-9 will launch its partnership with “It Takes a Village,” a series informing business partners about development opportunities tied to the USC Village, the $650 million housing and retail space — the largest development project in the history of South Los Angeles. The series will provide construction progress and upcoming contract opportunities, Price said. It also will feature outreach training and network events designed to inform, empower and prepare local businesses for those opportunities. Dorothy Randle, former associate director in Mayor Antonio Villaraigosa’s Office of Economic & Business Development, was named executive director of the CD-9 Business Center.